Looking for cost effective dunnage solutions? Our recycled conveyor belting makes for great dunnage solutions. When moving materials from point A to point B, you need to protect your products. Our belting allows for the right amount of protection. Unlike wood dunnage, or traditional shipping mats our belting will not break or splinter. If your shipping your goods internationally, you don’t need to worry about customs or duties not allowing or quarantining your goods because you used imported wood to pack your products. Our rubber belting can be easily cut to your needs. All semi drivers need to use tie downs or chains to ensure their load stays in place. Often these straps, especially chains can cause damage to the goods being delivered. By using our tie down protection strips or mats, your goods will be unaffected. Our tie down protection straps and mats will not break down allowing you to use them over and over. A coil rack is a piece of metal that stops the metal roll from moving on a truck. 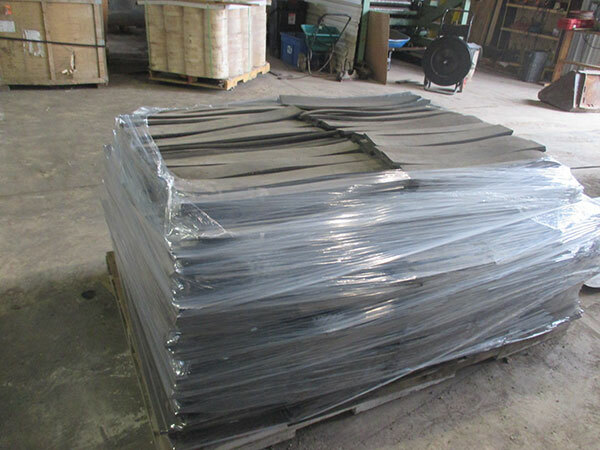 A coil rack rubber protection mat can lay underneath to avoid the rack moving, or on top of the rack to prevent it from scraping or scratching the huge coil it is supporting during shipping. When shipping extremely heavy objects such as concrete barriers our conveyor belt dunnage is the perfect material for the job. It will compress slightly but won’t slide. Being rubber it won’t break or splinter either. If you are looking for dunnage to protect sheets of glass, granite slabs, or countertops our recycled belting can be used to separate each layer. All our belting is also non-marking!